The Lebanon County Bar Association is pleased to announce its annual celebration of Law Day, which is designed to educate people of all ages about the legal system and to celebrate the American heritage of liberty, justice and equality. This year’s celebration will be observed on Friday, April 27. We take a slightly different approach to observing Law Day by focusing on children. Through classroom visits by lawyers and judges, our bar association works with schools to educate children about their legal rights and responsibilities. Our classroom lessons are designed to be informative and fun for all kids. Law Day provides Lebanon County lawyers and judges with a wonderful opportunity to become involved in our community. 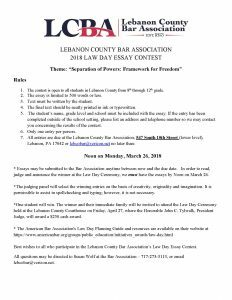 This year, the association is inviting all 8th through 12th grade students in Lebanon County to participate in an essay contest based on the theme, “Separation of Powers: Framework for Freedom”. One essay winner will receive a $250 cash award and will be invited to attend the Law Day and Naturalization Ceremony held at the Lebanon County Courthouse on Friday, April 27. Lebanon County Court of Common Pleas President Judge John C. Tylwalk will present the award to the winner. Contest deadline is Noon on March 26. Rules and guidelines for the essay contest are available by calling the Bar Association office at 273-3113 or emailing lebcobar@verizon.net. The American Bar Association notes the following about the theme: The U.S. Constitution sets out a system of government with distinct and independent branches—Congress, the Presidency, and a Supreme Court. It also defines legislative, executive, and judicial powers and outlines how they interact. These three separate branches share power, and each branch serves as a check on the power of the others. “Ambition must be made to counteract ambition,” James Madison explained in Federalist 51. Why? Madison believed that the Constitution’s principles of separation of powers and checks and balances preserve political liberty. They provide a framework for freedom. Yet, this framework is not self-executing. We the people must continually act to ensure that our constitutional democracy endures, preserving our liberties and advancing our rights. The Law Day 2018 theme enables us to reflect on the separation of powers as fundamental to our constitutional purpose and to consider how our governmental system is working for ourselves and our posterity. For more information, please call Susan Wolf at 273-3113 or email lebcobar@verizon.net.